We recently enrolled in Georgia Farm to Table, a Community Supported Agriculture enterprise in north Georgia. Once a week we receive a box of Georgia-grown vegetables and fruits, plus recipes, delivered to our door. Since deer are devouring much of our garden this year, it’s nice to have fresh vegetables to prepare. We’ve received eggplant, sweet potatoes, kale, lettuce greens, tomatoes, yellow squash, zucchini, acorn and butternut squashes, hot and sweet peppers, lady peas, green beans, and apples. I don’t usually buy or cook winter squashes so it’s been fun trying something new. A challenge was the butternut squash. I read several recipes for the squash and was eager to try cooking it, but I simply wasn’t strong enough to cut the tough skinned squash in half. Forget chunking it, not possible. I talked with a neighbor who is also receiving the Georgia Farm to Table box and she resorted to having a strong-armed yard service man cut up the squash after he finished her yard. No woman I talked with had actually been able to cut up the butternut squash herself. In order to cook the squash, all of us had baked it first and then separated the softened pulp from the skin and seeds. We then pureed the cooked butternut squash and used the puree in recipes calling for canned pumpkin or mashed sweet potatoes. There may be another method for safely processing butternut squash but I haven’t heard of it. I like the taste of butternut squash, but not the strain in trying to cut it up. 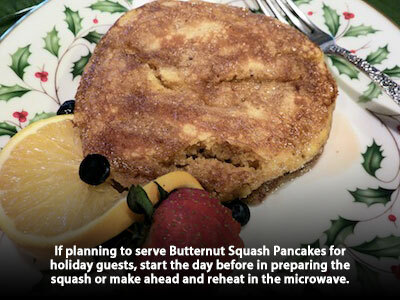 I did enjoy making these Butternut Squash Pancakes, which were an adaptation from a recipe for Sweet Potato Pancakes. Recipe is by Tommy C. Simmons. Prepare butternut squash. Peel butternut squash, pierce with fork and place in covered baking dish with 1/4 cup water. Bake at 350 degrees for 40 minutes or until fork tender. Remove from pan, separate squash from seeds and membrane with a fork. Discard seeds and stringy membrane. Mash squash with a potato masher and set aside. Whisk flour and spices together in large mixing bowl. Mix in brown sugar, eggs, vegetable oil, milk, and vanilla with a sturdy spoon. Add reserved butternut squash puree, should have about 1 cup to mix in. Beat with a mixer until everything is well mixed. If batter is too thick, add more milk, a tablespoon at a time. Melt 2 tablespoons butter in a medium size skillet over low heat. When butter is melted, pour 1/2 cup pancake batter into skillet. Cook until edges are set and middle is bubbling and flip to cook other side. Remove to plate and cover. When all the pancakes are cooked, serve with warmed syrup of choice. Leftovers can be stored in a plastic bag in the refrigerator and reheated in a microwave.